Our interview series celebrating 100 years of the National Park Service in the United States and the important role soil plays in these parks continues. We head to Massachusetts to gaze at the expansive 40 miles of the Cape Cod seashore with Resource Soil Scientist Maggie Payne. Maggie Payne is a Resource Soil Scientist at the USDA Natural Resources Conservation Service (NRCS) located in West Wareham, MA. Maggie has a BA in Biology and Environmental Science from Colby College. After receiving her M.S. degree in Soil and Natural Resources Science from URI in 2007, she worked as a soil scientist and soil conservationist for Rhode Island NRCS for 7 years; working on projects including the development of national standards for subaqueous soil mapping and analysis, coastal soil mapping, soil interpretation development, and GIS analysis. She spent two years as the northeast regional leader for the NRCS Rapid Carbon Assessment initiative in an effort to document the carbon levels in the Nation’s soils. In Massachusetts, Maggie is a ground penetrating radar operator, conducts wetland determinations for USDA programs, promotes soil health, and assists with wetland restorations. What is Unique About the Soils of Cape Cod National Seashore? The soils at Cape Cod National Seashore are very dynamic due to their exposure to consistent oceanic winds and coastal erosion. The soils are relatively young and the dunes are constantly migrating, burying adjacent soils and exposing others. Stretching along 40 miles of New England cost, the park features high cliff dunes of fine sand, naturally formed barrier islands, saltwater marshes, and tall pine and oak forests. The development of the park's maritime history can be seen through nearby fishing spots and coastline views. Home to the great white shark and encouraging scientists and biologists to study species and this coastal environment they call home. What Do the Soil Colors of Cape Cod National Seashore Tell Us? The colors and the soil textures can give us a clue as to the source and age of the soil material. These soils started forming after the most recent glaciation (the Wisconsin Glaciation), when the meltwater from the retreating ice left large sandy outwash plains with scattered wet depressions from melting ice blocks. Lower and wetter areas formed forests and wetlands, while the dune lands remained sparsely vegetated. Vegetated areas and wetlands add carbon to the soil, darkening the color of the soil surface and creating dark peat deposits. Further soil development occurred over time, creating redder oxidixed iron layers and leached gray layers in some soils. With the exposure to high winds, dune sands moved to cover some of these lower areas, creating buried soils. As the beach erodes, some of these buried soils are exposed on the shoreface (see photo above). The black peat deposits and red soils that developed thousands of years ago in kettle depressions now contrast with the white sands of the Cape Cod beaches. The colors and the soil textures can give us a clue as to the source and age of the soil material. 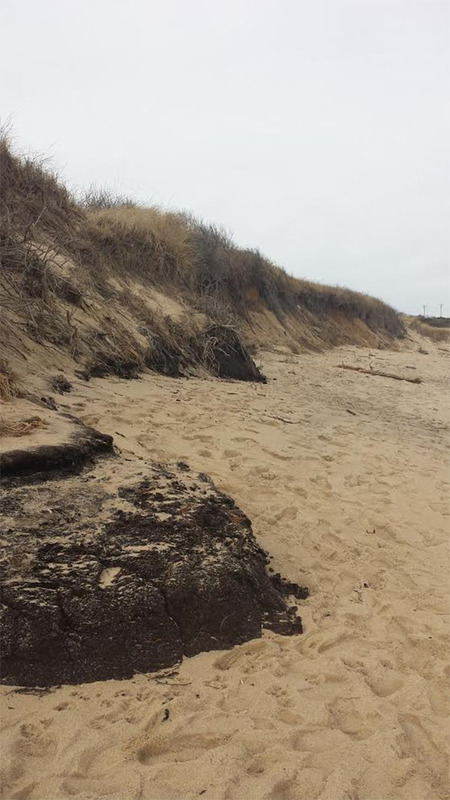 How is the Approach to Soil Science and Management Changing at Cape Cod National Seashore? Soil science has long been associated mainly with agriculture. The first soil maps in the United States were created to identify the best farmland soil. The beauty of soil science is in the vast amounts of data that is gathered on all sites enables the data to be used for so many other applications. In addressing the current issues of climate change, sea level rise, and coastal erosion, soils can be used to estimate the amount of carbon that is, and can potentially be, sequestered in the soil. We have also begun studying and mapping soils that are submerged underwater. Salt marshes and other terrestrial landscapes that have already been submerged can help us predict what our landscapes will look like as the sea level continues to rise. More emphasis on detailed soil maps of the coast can help us plan and manage coastal communities in the face of greater coastal erosion risks. What Is the Top Concern in Soil Management? Carbon sequestration in the soil is one of the top concerns and potentials for soil management. 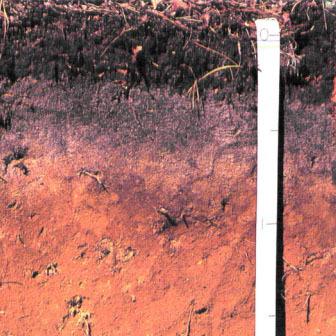 Soils have been identified as a potential sink for atmospheric carbon if managed correctly. There is already a large amount of carbon stored in the soils – buried in Cape Cod National Seashore, in salt marshes and in peatlands. Keeping that soil carbon in place should be a priority. There is also a huge potential to sequester more carbon in the soil in the agricultural setting by changing agricultural management to include cover cropping and reduced tillage to name a few. These practices and others have the potential to increase land productivity while removing carbon from the atmosphere.